Will you be charting your Hajj on social media? More than two million Muslims from around the world will gather in Mecca, Saudi Arabia, to mark the annual Hajj pilgrimage. Hajj is a mandatory religious duty and must be carried out at least once by all adult Muslims who are able to make the journey to Mecca. The Mecca pilgrimage includes a number of rituals that must be observed. Are you undertaking Hajj this year? Will you be sharing your experience of Hajj on social media? Are there any stories about your Hajj you'd like to share? If so we want to hear from you. Email haveyoursay@bbc.co.uk and tell us how and why you're sharing your Hajj experiences on social media. 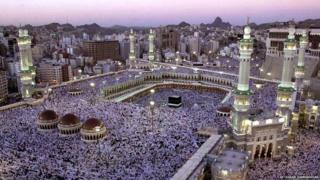 What is the Hajj pilgrimage?